Arizona's temperatures and infrequent rainfall are well-known. In fact, many people flock to this state to live in an environment that is free from snow and other harsh weather conditions. 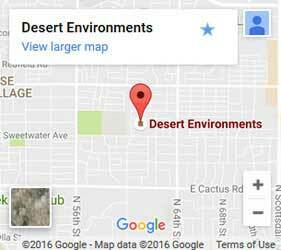 Unfortunately, that lack of moisture can be the downfall for landscaping in Scottsdale AZ if it does not use water efficiently. 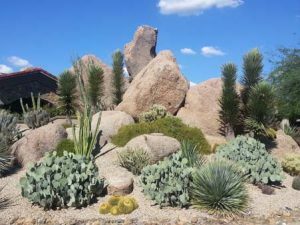 It is important to find a landscaper who knows how to create landscapes that are drought-resistant and sensitive to the region’s arid conditions. Checkout the following tips to ensure that your yard uses water-wise landscaping. There are certain plants that naturally require a lot of water. If your yard is full of these varieties of vegetation, you may be using more water than you should to keep them alive. Cacti, succulents, and beautiful flowering vines do extremely well in Arizona. Checking the tags on plants before you purchase them can provide you with the information you need to know whether the plants will need more water than you feel comfortable using. In order to get the most out of your watering, it is best to plant trees, shrubs, and other plants in groupings. Those that grow naturally together or need about the same amount of water should be planted together. Good soil can resist evaporation and help retain moisture. Regular cultivation and the addition of compost or other organic matter can significantly improve the quality of your soil, allowing you to water less with better results. While a lush green lawn looks very appealing, it is difficult to provide enough water to maintain large amounts of turf in Arizona. Stick with small areas of grass or choose a native variety, such as Buffalo grass, that can stay green without as much water. For more information on what will grow well in your home or around your business, call a landscape contractor. There are many water-wise landscaping options to plan just the right outdoors space to fit your needs.